An 'Australian Hotel' was first established on the Fitzmaurice Street site in 1856 as a single storey building by Thomas Byrnes and his father-in-law, William Brooker. It contained twenty-two rooms as well as a large ball or concert room and excellent stables at the rear. It was rented by John Joseph Fennell in the early 1860s and was later purchased by R.J. 'Bobby' Higgins. The licensee for many years was Peter James McAlister (1867-71 and 1879-91). In the late nineteenth century, it was known as P.J. 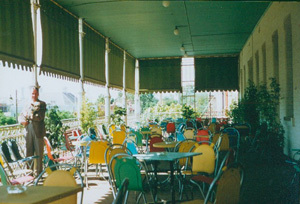 McAlister's Australian Family Hotel. During the 1890s the auctioneers Wood & Horwood had offices at the Hotel. This original building was demolished in 1911 and rebuilt in 1912. It remained a hotel until the 1960s when it was remodelled to become the Australian Arcade. 'OLD TIMER GONE / A link with Wagga's early history was / severed with the closing down of the Australian Hotel in Fitzmaurice Street on Saturday. / Established 106 years ago, this hotel was one of Wagga's oldest places of business. / It became an integral part of the city. / A place where, for more than a century, Wagga and district people met, and where, over the years, thousands of visitors to the city found hospitable lodgings. / The Australian had its share of roistering and convivial fraternising - what public house in existence for 100 years hasn't? / But it was also the venue of some history making meetings. / For instance, it was at the Australian Hotel on June 5, 1860, that a meeting was held to form the Murrumbidgee Turf Club - an organisation that through the years has become one of the top racing organisations in the country districts of the Commonwealth. / The demolition of the hotel in favour of the establishment of a business arcade strikes another blow for the new mode in public accommodation and entertainment - motels and licensed clubs. The Australian is the fourth hotel to be closed in Wagga in the last couple of years. / Whilst it might be bowing to progress, it is sad that a business establishment that has served the district so well for so long has gone out of existence'. Cecil William 'Cec' Toy was born 30 August 1905 at Black Forest, a suburb of Adelaide. He left school aged 14, and became a counter assistant selling leather goods. Within five years, he started his own business manufacturing and selling similar wares from a base in Adelaide. He entered the hotel business at Bordertown (SA) then successfully took up hotels at The Grange, Norlunga and Port Augusta. 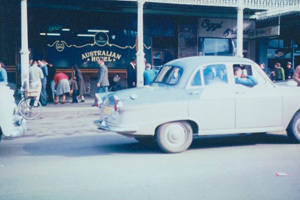 Cec came to Wagga Wagga and on 6 March 1939, with his wife Kathleen 'Kath' bought the lease of the Wagga Hotel (SE corner Baylis and Edward Streets). In 1941 he bought the freehold of the Australian Hotel, Fitzmaurice Street, and later bought the Advance Australia Hotel (east side of Baylis Street) from Henry McDonough, which he conducted under management. 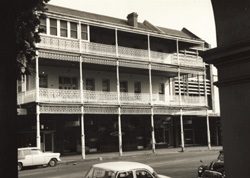 Cec retained ownership of the Australian Hotel until its sale (for remodeling) in 1963. 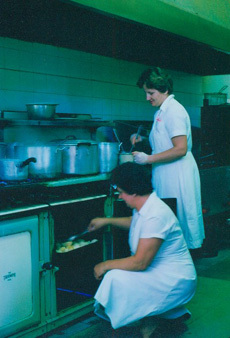 The Museum has been donated a wonderful collection of colour slides taken by Cec Toy. 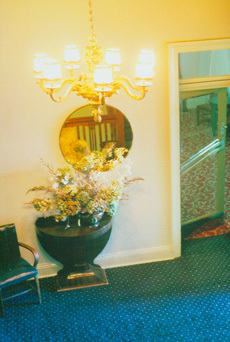 Many of these show previously unseen images taken throughout the interior of The Australian Hotel. Some of these have been reproduced above.